Exciting news! You as a Kindle owner or Kindle app user can now borrow Kindle ebooks from your local library! How awesome is that? I admit, I haven’t been to a library in way too long. Other than the college library for school stuff, I probably haven’t visited a library for pleasure reading since high school or earlier. Sad, huh. I recently applied for a library card with my local library system, but I didn’t go pick it up right away so I think I have to reregister online again. Oops. Anyway, I first read about this news on one my favorite tech blogs, TechCrunch. Amazon has a page dedicated to Public Library Books for Kindle and it seems to answer any questions that you could have. You can go to the OverDrive search website to see if your library participates in this program and if so, you can go to your library’s website and check out ebooks to your Kindle (you must have a library card, though). The only downside that I see is that the libraries must only have one or a very limited amount of each ebook. I did a quick search on some popular titles in the Carnegie Library of Pittsburgh site and many of them were checked out. I believe that there is a two-week lending period for each title, but it looks like you can put yourself on the wait list. Wonder how long that would take. I’ll have to check it out as soon as I become a responsible adult and get a new library card. I’d love to hear from you if you’ve tried this with your local library! Any success stories, pros, cons? While we were honeymooning in California, we met up with a friend of my husband’s in San Francisco. We were talking about books and I mentioned my blog, and he recommended a new book recently released by a friend of his. I downloaded it during dinner because it sounded so fascinating (but didn’t start reading it at dinner, because of course that would have been rude). 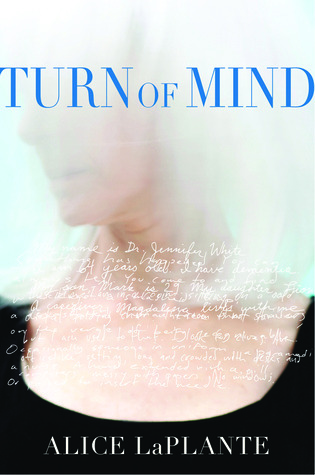 In “Turn of Mind”, Dr. Jennifer White is a retired orthopedic surgeon in her 60′s. She also has been diagnosed with dementia. It also just so happens that her best friend, Amanda, was recently found murdered. Jennifer has her good days and her bad days and often doesn’t even realize that Amanda is gone or who her children are. Jennifer’s husband passed away a few years ago and Jennifer often mistakes her son for her late husband. She has a caretaker who she sometimes doesn’t recognize and she has escaped from the house on multiple occasions. What is even more confusing for Jennifer is the fact that she is being questioned as a suspect in the case of Amanda’s murder. Amanda was found with several fingers severed… in a manner than only an expert could do. Does Jennifer remember what happened? Did she do it? And if she did, what would possess her to kill her best friend? The story is told from Jennifer’s perspective, bouncing back and forth between coherent and way far gone into the depths of dementia. This was one of the most uniquely written books that I have personally ever read. You are getting a firsthand account of what a person may go through when suffering from dementia and it is both extremely sad (particularly if you know anyone who has been diagnosed with Alzheimer’s) and completely enthralling. It’s a murder mystery where the suspect doesn’t even know if they committed the crime. There are actually some funny parts to the story but some heartbreaking ones, too. I found a great interview with Alice LaPlante if you want to learn more about the back story and why she wrote about dementia. This is her first novel and I really hope to see something else from her in the future. Trust me, you will not want to put this book down after you pick it up. Cheap books (or ebooks) are my weakness. Did you see that Amazon has 100 Kindle books for $3.99 or less ?!? My dream come true! No, my dream would be that they’d all be free. There’s a pretty decent selection and it really looks like there is something for everyone. If you’re looking for something to download and have the same taste in books as I do, I recommend “Shanghai Girls“ . There are a few on here that I’d like to read, including Alicia Silverstone’s “The Kind Diet: A Simple Guide to Feeling Great, Losing Weight, and Saving the Planet ” (I’m not vegan, just pescetarian, but I’ve been wanting to learn more about her philosophy); “The Dowry Bride” by Shobhan Bantwal (I read and blogged about one of her other books, “The Sari Shop Widow“); and “The Condition (P.S. )“ by Jennifer Haigh (haven’t read anything else by this author but the story looks interesting). There’s a few others on there that I wouldn’t mind getting, too. Sorry, wallet. Check out the list and let me know if you recommend any others! So remember how excited I was when I received my first request to review a book? Imagine my excitement when I got another request! Heather Wardell asked me to read and blog about her book and I was so pumped to see that it was just the type of book that I love to read. 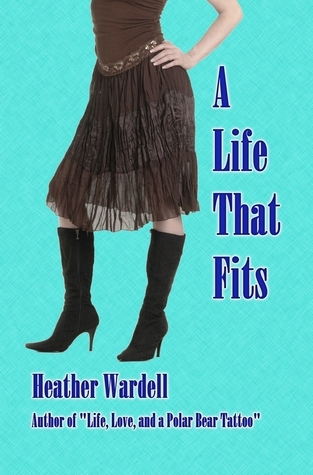 “A Life That Fits“ is about a girl named Andrea in her late 20′s. She’s been with her boyfriend Alex for…. well, pretty much forever! They have been dating for 14 years and have been living together but aren’t engaged. Yet. Andrea is on her way home from a business trip and is convinced that Alex will be at home waiting for her with a ring and a proposal, based on the way he’s been acting lately. Oh, was she wrong. Turns out, Alex confesses that he’s leaving her for another woman. Andrea is devastated (rightly so!) and falls into a depression and can’t even make it into the office for work. Alex had told Andrea that his “other woman” was basically Andrea’s total opposite. Andrea finally gets back up on her feet after deciding that she’ll become her opposite and maybe that’ll be what Alex wants and he’ll come back. She is more outgoing, dresses in clothes that she normally wouldn’t buy (colors!! ), etc. This helps Andrea in a few ways, making new female friends, for example, but also hurts her. She is basically ousted from her job, but luckily has already accepted an offer with another company in the office park. She has a new girl friend at the new job, and she also develops a crush on a coworker that starts to develop into more. But Andrea is torn…. she likes her new life, but does she still like it if Alex isn’t in it? At first, I wasn’t sure about Andrea because I was getting mad that she wasn’t snapping out of her funk. But then I wondered how I would feel if I were in her shoes. After she developed her opposite plan (even though I didn’t support her going back to Alex), I began to root for her and hope she would realize that she didn’t need Alex to be happy. I rooted for her even more when she started to get eyes for another man! Go Andrea! I also wanted to punch Alex. There are some little twists and turns in this book that I didn’t quite expect and some others that I kinda figured out on my own. The characters were written as normal everyday people… nothing glamorous or fancy, but people like who you may personally know. Those are the kinds of characters I really like and can totally relate to. I can’t wait to read more of Heather Wardell’s books! She has six other books out, and if you have a Kindle… they’re either free or $0.99! Awesome! In fact, I just downloaded her first book, “Life, Love, and a Polar Bear Tattoo“ , as I was writing this post. It’ll be next on my list to read. Thanks for the opportunity to read your book, Heather!